Above is the 30 minute chart of the SP500 showing the entire wave up from the final blue fourth (circle). I’ve put circles around the large fourth waves that have been causing me to label this entire wave as corrective (which meant a triangle was likely). It does not look like a motive wave, but when you get to a situation with such low volume, wave structures tend to get a little bit wonky. If this count is correct, (I actually have only changed the upper part of the wave in terms of the count), then we’re looking at an imminent top … perhaps even tomorrow. Currencies don’t support a top other than the fact that they’re trying to go up in a corrective wave, but aren’t moving. Otherwise, currencies still have a major wave to go, but it may finish up after the US market tops (which has been an alternate scenario, and why I’ve been suggesting more time for a top). The final waiting game begins in earnest. The resolution to this “never-ending” rally will obviously be in the New Year, but when? Based upon the current position of the asset classes I cover, we’re looking at the first quarter. We’re in the final Elliott Wave pattern – a contracting triangle, although not technically confirmed. The potential ending diagonal has failed and so all that’s left is a traditional triangle of some sort, the “contracting” variety being the most common. The US equities market is, for the most part, “done.” The over-arching wave structure is complete. We’re in a final fourth wave pattern that will resolve and change the direction of the trend with one more slight rise to a new high. However, the US Dollar and related currencies all have one more slightly larger wave to complete. As the dollar is the reserve currency, it defines the ultimate market direction; All other asset classes have a relationship with the dollar, so they’re all affected by its movement. Once it completes the topping process, everything else will turn. I think we have another couple of months left while the US equities triangle unfolds to a slight new high, and the dollar seeks a slight new low. Once demand for the US dollar increases (as debts demand payment in the reserve currency), deflation will start to engulf the financial system worldwide, as it always has in each depression we’ve suffered throughout history. Contracting triangles move sideways and burn up a lot of time with their up and down five waves. They end up with a final wave to a new high. The final wave up is typically the same length as the widest part of the triangle, but not always. So, while we can’t count on it, it’s a good guideline. Once we have the contracting triangle confirmed (with a larger drop in a C wave), there’ll be some high probability trades that set up. But we need confirmation first. As I wrote last week, it’s the dollar that will have the last word on the top, but they’ll all join the parade to a final top (each perhaps in its own way. A little more patience is warranted. There have been no material changes to my prognosis. We are at the high. I expect this final wave to breach the previous high for the final time. Although a bit early to call, based on what the rest of the market is doing, the highest probability pattern unfolding is a contracting triangle. Volume: It's dismal. The only thing apparently holding this market up is the action of the US Dollar, which still has to bottom. Summary: The count is full for the US market in general, except for small subwaves that form the balance of a motive set of waves in SPX and some other major US indices. I'm leaning towards a contracting triangle as the final pattern, although confirmation is needed, with the completion of a C wave to the downside being the first step. Above is the 60 minute chart of ES (click to enlarge). Please watch the video to get the full story on what's happening short term. Last weekend, we knew we were dealing with a triangle of some type. Although I wasn't expecting it, we completed a tiny one with a double top. I've traced it out on the screen above. Other than the NYSE, it appears to be the only index that went to a new high. As a result, I have to label the double top as the completion of a complex zigzag (perhaps a "triple"). There's more than one way to label this chart, so we'll have to see what waves trace out this week. The key here is that the wave up is corrective, which means a top is not in place. As well, the waves down are in all the indices are also corrective and that means we have one more wave up to a final high. I expect a low volume week, with a bounce to start it off and a then a continuation down to the lower trendline. I've placed two lower trendlines on the chart—where the wave down stops will determine the width of the triangle, if that's indeed the pattern unfolding. 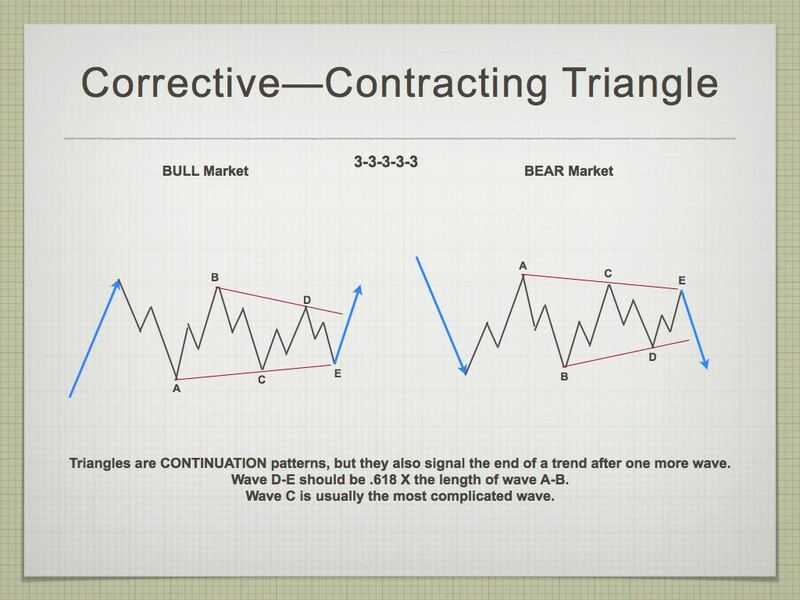 At this point, I have to leave it to the market to confirm the contracting triangle pattern. Short term: The wave larger count is now virtually complete. We're tracing out a triangle of some sort. I'm leaning now towards a contracting triangle as being the operative pattern; however, we need confirmation from the market with the completion of the C wave down. ES under 2721 is really important. 5 minute chart is interesting yet way to soon to call it . then sell them shares . Distribution , easier to see with a 60 minute chart than a daily chart. How long it lasts who knows . If we manage to close above 2730, I am going to conclude that we are seeing at the very least some sort of fifth wave extension. It was my original plan to scale into short trades as we moved toward 2730, but as several have pointed out we are simply not seeing any signs of an impending reversal. I think it is noteworthy that VIX seems to be trying to print a green candle today despite the new all time highs, but it has not really taken off to the upside, a sure sign that smart money is getting positioned for a change of trend. It continues to be a very tough market to gauge, so nothing to do but watch and wait imho…just when you think that things could not possibly get any more extreme, they do exactly that. ES looks like it’s headed for a double top. The waves up look corrective so I can’t see us doing more than a double top really. These gaps are truly stunning. We even had a very rare one in futures recently. Folk, this is some entity, or entities actually buying the market AT THE ASK, namely a huge market order, right at the open. This either bullishness running amuck, or as Joe suggests, a really sly con game to induce market chasers. Yikes! This is a 3rd wave. Not a terminal wave. We still have a 4th and 5th wave on the weekly still to play out. Sorry for the bad news. Not bad news if you are right, but an opportunity for another long upside scalp. I was out at SPX 2700 but may have been a bit early if we close above 2730. Avi Gilburt agrees with you that we are finishing a high degree third wave. all options should be on the table……….the market will reveal itself which option is correct, and which one is incorrect. Then what on Earth would be the point of EW and my work? You may have finally given me the reason to shut this sucker down. gosh – peter, you took my comments out of context………..
“options” for me, is the same as “alternates”…………and depending on the time frame under analysis – we all have “alternates”……………. so the above is my…… “go to”……. comment to placate others who have very different counts……. in no way am i disparaging of your work, or EW…………..
Verne, it might be terminal after a 4th and 5th, or that might be major 1. We will see. You never know. Indeed Dan. No analytical method is 100% accurate and this market in particular has been full of surprises. I learned from one of my teachers that you can be successful being right on only 60% of your trades if you limited risk properly. I was talking to Sven about how he felt when the market continued to defy technical signals he had employed for years and which have become more extreme than he ever could have imagined possible. He had a list of hedge fund managers in a recent article that had thrown in the towel in frustration and we are not talking about lightweights. Those of us who have been bearish because of all the technical and fundamental considerations, and I have certainly been one of them have been wrong the past few years. Pure and simple. This does not mean I was not willing to trade the upside but I have to confess I did it with extreme caution. 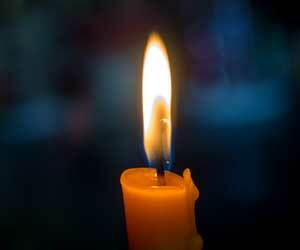 It also does not mean that the technical indicators or fundamental indicators have been wrong. I recall the famous quote about the market remaining irrational! In one sense it is not that the market has actually been irrational as we know that trillions have been injected by central banks that had absolutely nothing to do with revenue growth and true price discovery. This has been done in a way that is absolutely unprecedented so not wonder the consternation of so many thoughtful individuals. Bottom line, Sven said that the market action the last few years has taught him a thing or two about humility, and that even when a bearish outlook is in our own minds well justified, we can never be dismissive of those with an opposing viewpoint. I remain extremely bearish based on what I know about how this market got to where it is. I am nonetheless prepared to carefully take advantage of further moves to the upside if the price action warrants it. I really do appreciate those like you with a different perspective as it helps us to clarify and dispassionately examine our own. Just my two pence. as you mentioned, no indicator is perfect. some genius can be wrong sometime, let alone layman like me. So, to me myself, it doesn’t matter up or down. I think technical indicator only makes up 15% factor of your winning/losing. Of course, if you predict the market correctly, you can let the profit ride. The most important thing is your strategy (note: strategy = how you react if market against you) and money management…. Great point Allen. Nothing is more important in trading than getting the trend right. The fact of the matter is the long term trend remains up and has been for several years. As bearish as I have been, to deny that is illogical on its face. In my humble opinion, any analysis that fails to get the TREND right is not worth the time spent reading it. Not that I’m calling a top quite yet, but the upside of ES/SPX and the other US market players is EXTREMELY limited. Interesting!! I read the analyses this evening of two very capable analysts (in my view) who employ EW. One said today’s action as a break-away gap. The other saw it as an exhaustion gap. The first sees the end of a fourth wave and the start of a minute five up. The other sees a fifth wave completed just beyond a expected fib level of 2717. One of them will be proven wrong in next few sessions. If is is indeed a break-away gap this upward run is going to extend beyond just next week. Of that we can be certain. If upside is limited how much do we correct from here. Do you think we visit 2680 and go back up again. several of the energy charts I track show a blow off top for the S&P @ approx. 11:00 am Jan 5th and then the down trend kicks in for the day. Is this the final top? I don’t know? Yet I choose specific time frames before taking the trade . That is defined . That is a warning to me . I made a note earlier today in regards to NYA in terms of price . Has its own strategy behind it. What bothers me more than anything is this. The present time frame we are in should be a cyclical high . The question is what will bring the drop .??? Has so many 123 type moves its confusing . A solid idea what’s going on. Sold every stock I owned months ago . That I do not want to see any all time highs past March . An eye on yet JNK has been rising which makes no sense . The dollar looks heavy yet I think its bottoming . Throw in the towel . Patients wins more times then not . Joe, like you I do have to admit that right now I am really not sure where we are in the market’s progress toward a final high. As I indicated earlier, EW analysts whom I consider far more experienced and skilled than I am are seeing things quite differently. Prechter called a high a few weeks ago based on a completed wave count and extreme sentiment. I saw that count and although it did not violate any EW rules that I could identify, it was clearly incorrect. Wave counts currently labelled absolutely according to EW rules can, and often do change into another structure. I am going to repeat something I have said here many times and of which I remain firmly convinced. There is no way I can prove what I am saying. It is a conclusion I came to the night of the election when I saw the markets bought out of an incredible sea of red by what was clearly a coordinated central bank injection of liquidity that traders around far longer that I claim to to have never before witnessed. After that remarkable event, I concluded that this market would never experience a normal correction as long as central bankers were able to prevent it. At the time I concluded that, mostly on instinct, I did not necessarily have a lot of sound reasons that I could offer, but over the months as I dug into the immensity of the liquidity pumped into this market and the kind of multiplied leverage engaged to move prices to these nose-bleed levels, it became almost self-evident why even a slight market correction would spell complete disaster for the entire system. It is no accident that we went all of 2017 without a single correction. Does any rational person think that this is really normal for a market? Even third waves ebb and flow so all the clap trap about how market intervention does not affect price action I consider the rantings of thoughtless folk. They are saying without stock buybacks, SNB tens of billions of purchases of tech stocks, and Q.E, we would STILL see markets at these levels…HOGWASH!!! The implications are clear. WHEN, and IF, the market embarks on a REAL correction, it would be evidence that the central banks have lost control. This is the main reason why I personally have serious doubts, no disrespect to analysts like Avi Gilburt, that we are in a third wave at high degree, which will be followed by a normal fourth wave correction, then onward and upward to “happy days are here again!” I think that for all the reasons cited ad nauseam, that when this market begins to fall, there is going to be no stopping the carnage. Obviously I could be wrong. But when I consider all the evidence at my disposal, and the fact that times and markets may change, but human nature does not, I contend the ultimate outcome of the situation we find ourselves in is a foregone conclusion…nothing new under the Sun! All the bulls confidently long this market are going to be ultimately slaughtered…they always are….! BTW, if you think that when I say “IF”, the market embarks on a real correction I am implying that it is going to go up for ever you need to have your head examined. I know most of you will get EXACTLY what I am implying…. i have always contended that an “event” will need to occur to rip control of the markets from the CB. according to their past writings – BIS and IMF…etc, their desire to move the world to a single currency – controlled by a single ‘banking’ institution, rather than a country – would explain the collusive effort by the major CB to blow a “world wide” monster asset bubble. 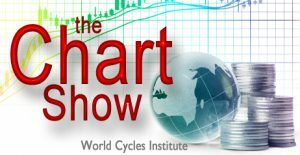 the currency “reset” will happen quickly and seamlessly when the bubble is popped. They will of course, have a “false flag” event to blame for the “popping” event, this much is certain. is it “happenstance” that the market “tail risks” are too numerous to count?? We are challenging the underside of that 30 year trend line on the Monthly bar chart of the S&P. Could get really interesting! Thanks again for providing that precise calculation of the trend line for the month of January. Ed, I have actually calculated the exact numbers for the daily chart from the 1987 low to the March ’03 low (in my earlier post that gave the monthly number, I explained that the March 2003 low appeared to be the preferable low to use because the March ’03 low would have fallen slightly below the trendline if we use the October ’02 low i.e. the March ’03 low was the external low extreme on the trendline from Oct ’87—remember this is all with a log chart). To the point…today, January 5, 2017, the trendline from the 10-20-87 low on a daily chart through the 3-12-03 low is at 2734.17!! Fascinating to be sure. The maket nontheless continues to demolish one significant fib, cycle, or high low trendline relationship after another…still undecided whether to nibble on a long trade with a close above 2730…. My concern sits with the us dollar. alot of my thinking over the past 20 plus years . the crypto currencies also play into this . im beginning to watch them more closely . present cold spells in the mid west and east coast of the usa . its winter right ? so it is to be expected . yet they did recently get snow in Florida . my brain is to tired to note. As was told to me many years ago when i first started working on the ocean. Mother nature does not ask for your respect, She Demands it . ill say this and while it is based on many things ill keep it simple. with in 3 years we will wish that we had today back . way to many things all coming together all at the same time. my focus is more and more commodities and less and less the stock market. I just love your quote about Mother Nature Joe! The period of sunspot minima, about which few are talking, is indeed huge (Yuge?!). Its advent is going to make all the machinations of central banksters akin to confidently building sand castles on the beach ahead of an incoming tsunami! I cannot account for the momentum and rsi divergences we are seeing if we are indeed putting in a third wave top, unless it is explained as due to being the fifth of a third. Even then things still don’t line up as expected…. Utility stocks are in a developing 5 waves to the downside . 1 1/2 half months despite the rise in the dow and spx to record levels. for a low in this index yesterday . in wave IV of wave 3 then we have a few parameters to consider. high at 730.14 and a .382 retrace of wave I II III targets the 726.55 level. the previous wave iv sits at 727.20 .
you look for a move back to the 4th wave of one lessor degree. the wave count so far has not failed . and they are going to be the leaders to the downside. in the dow or the spx . Yes indeed. We could have a whole other very interesting conversation about what rising rates are going to do the biggest bond bubble in history, which is where I think the fire will start…. all clustered in March 2018 .
so it is what it is . It is what it is is all im going to say . prefer to focus on the here and now rather than the “ultimately”…in my view, SVXY has been and will continue to be a market ‘tell’…SVXY is sure looking toppy! For the non-7 numbers: add the bookend numbers & the inner pair. 2+5=7, 3+4=7 so you have 7777. And God rested on the 7th day lol. Perhaps swing high? One huge problem I am having with this market is the apparent break-down of technical indicators. Here are a few that the market has ridden rough shod over in recent sessions: candlestick dojis, price movement above upper B bands, dojis ABOVE upper B bands, same day fill of open gaps, island reversal patterns that were negated a session or two later. Does all this seem normal to you guys, or is it just me? I am not going to even mention the long standing divergences that the market just seems to perenially ignore. You can probably see where I am going with this, namely, what kind of reversal signal will now prove reliable after all of the above??!! Beats me…! That is a must read!!! Are Peter T and Peter G offering a prescient market level for a potential market turn? Not trading or investment advice. let’s talk about an aspect of this bubble popping “reset” that is often overlooked. CB are draining liquidity with balance sheet run off’s , interest rate hikes, and QE reductions [europe/japan]……. …….the collusion of CB’s to prick the worldwide monster bubble is on………………………….so the “overlooked” aspect of “tightening” financial conditions is the price of OIL……. OIL is really the new interest rates……. “miraculously”…………. the price of oil is repricing at higher levels…… from 50$/brl to 60$/brl………. in the last month….that 16%ish?? – of economy wide type – monetary tightening………………. pump and dump wall street – is “bitcoin” accelerating equity prices to the upside- 23 days for dow to move from 24k to 25k – as the are well aware of the stealth amounts of monetary tightening……..and the consequences thereof……. yes – point well taken. What is your take on Peter G’s post made at 7:15am today identifying the “precise” price level of the 30 year trend line on the S&P monthly bar chart that you posted a few days ago? I feel really badly for Bob Prechter. He is now apparently expecting a blow-off commodity like top going to “crazy” levels as price has already exceeded his highest fib line in the sand at DJI 24899- 25015. Very sad! Quite true. None of us are omniscient. My sadness has to do with the many readers of Bob’s publications who unquestioningly take what he says as gospel and have probably lost money as a result. I foolishly once did. Bob is is a far more gifted market technician than most of us can ever dream of becoming. I am sad for him because I have never once heard him admit the obvious, and which in my view would enlarge the man’s stature rather than diminish it, and that is simply: “I was wtrong!”. what a gosh darn second here – are we eeking out a baby ending diagonal? Let’s finish the possibilities for the underside of the Oct ’87 low to the Mar ’03 low trendline. I have given the monthly reading for January and the daily reading for today. Only missing item is using the weekly chart (log scale again, of course). For the week ending today, January 5, 2018, the trendline is at 2739.58. For practical purposes, we have now reached that underside for all three time-period charts. As I write this, the SPX high today is 2737.49. Stay tuned! This wave 3 just keeps on going. Shorting wave 3’s is a dangerous game. Well Dan, after doing my own due diligence, I am going to take the other side of this trade. You can join the herd, or you can bet against it. I should have been able to buy volatility today for the cheapest it has ever been and I could not, why not? I am concluding it is unlikely to get any cheaper, and therefore bought SPY 250 strike puts expiring September 21, 2018 for 5.15 per contract. For some reason only two expiration dates are offered for that month. Now let us all discover where the true danger lies in this market, shall we? This trade is of a considerable size so I am putting my money where my mouth is. Now I am done talking. I think we have all had quite enough or blather. I have been long for a long time so I’m good when this thing decides to turn, but the Fed is short volatility so be careful. the most insightful post you have made to date…prima facie evidence that you are not posting your own thoughts/beliefs…do you truly believe that zero hedge got the inside scoop that “the Fed is short volatility” (https://tinyurl.com/y79nqmrl)…or is it more likely that was a ‘planted’ article to fool the unwitting? FWIW, before the market opened this morning a notable market timer issued a buy on VIX…coincidence? I just finished reading and re-reading that zerohedge article and while even a totally blind trader could not miss that volatility was being artificially suppressed, the scope of the manipulation now revealed by the FED admission is no less stunning. I had always planned on moving my funds out of most of my brokerage accounts prior to the onset of the crisis and I am now determined to do so first thing on Monday after reading that article. Here is my take: Of course it is no co-incidence that the information is now finding its way into the public domain. I wondered out aloud several times today why volatility was not heading to all time lows with the current market action. We may now an have the answer. as criminal conduct by destroying price discovery in the markets, and wrecking any means whatsoever of ,market participants’ making sound judgments regarding value at risk. I prefer to observe from a distance. I will be quite content to have my requested funds safely wired to my local bank first thing next week. If this does not send shivers down every trader’s spine they are brain dead. ‘Nuff said! If the FED is actively shorting volatility, and they are by their own admission, I am not interested in taking the other side of that trade until the market clearly breaks. When that will happen is clearly difficult to predict. Even then spreads may become so outlandish and so quickly there might not be an opportunity to get position. Powell’s comment about protecting investors from “serious losses” displays a hubris that it breath-taking as it is chilling. How are they going to unwind that massive short vol trade when the market begins a plunge and the whole world madly scrambles to secure insurance against their long portfolio? The FED apparently has made a bet that this will never happen. This cartel has been beset by complete madness! Where would that “weekly” trend line be for week ending January 12th? Wow!! Most interesting!! Thank you for responding! I guess I am surprised that there are not more comments about the trend line that you have precisely calculated. It seems to add credence to Peter T’s EW analysis that a Top is perhaps in the works right around here. I will be watching that 2743.99 level with great interest this coming week! Thanks for sharing! Hoping you will update us with you thought, I was thinking you were thinkng 2730 max and little update..what do you see next. thanks for your feedback. Does anyone recall the last time all three indices closed above their upper b bands? I think 2/15/17 for /es, /ym and /nq. the last time the monthly rsi was near this high, the market rallied over 100% in 3.5 years. Just keep an open mind. Have a great weekend everyone. This is a great market. Yep! Technical indicators have been rendered less useful due to unprcedented CB relentless injections of liquidity at any sign of market weakness. When will it end?! Well, that 14 period RSI I don’t happen to use, but just thought it was intersting info. The only thing I’m sure of right now, is this 3rd wave isn’t quite done yet. Yep. The move up sure has the momentum and angle of a third wave. I am re-working a few counts to see that as an alternate instead of a five. One has to be patient and flexible about these things. I may enter a small long position with the small position left in my account next week and just use a trailing stop to try and catch the turn. No point fighting the trend which is currently clearly strongly up. 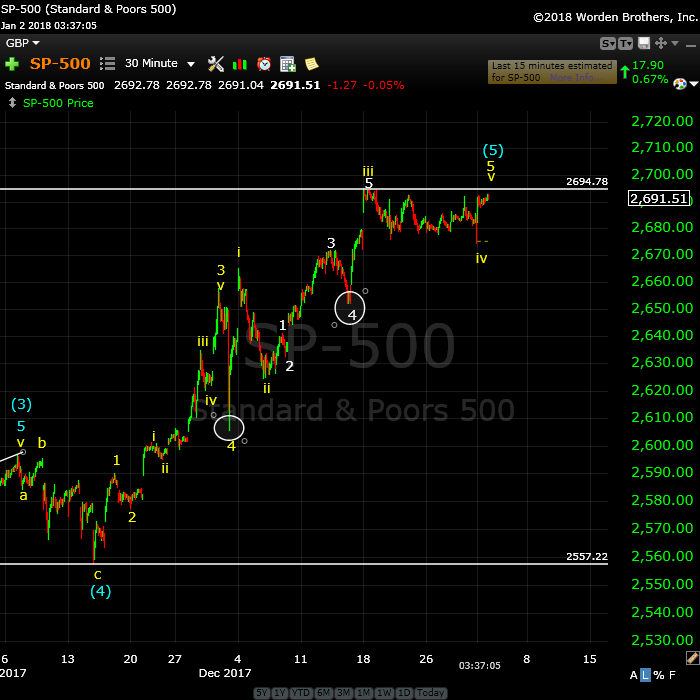 Peter Goodburn had a target of 2766 to complete wave 3. Wil you be making your weekly post? We can make a (10-50%) decline until the end of march. Since 1950 January trading days with a better than 2% pop have resulted in a positive year, averaging almost 20% to the upside…every time! That historical fact is however facing some tension from another notable one, namely over a failure to trade 5% from a 52 week high in over 400 days as recently noted by Zerohedge. I forgot to mention that according to the second statistic cited by Zerohedge, the previous three times the market failed to move over 5 % from a 52 high for over 400 days we witnessed a better than 7% decline in the 30-40 days following the event. The market has relentlessly smashed all expectations of bearishness, seasonal or historical so the above fact in no way guarantees the ramp higher will not continue. Someone pointed out that margin debt is now around 600 billion compared to about 450 billion in 2006 and based on the relative market evaluations from then to now, further extreme is certainly possible. Looking forward to where futures open this evening…! I just talked to him. He thinks we are starting an ED! willem – genius!!! yes i think so! Is that ET you are speaking of? Just curious!